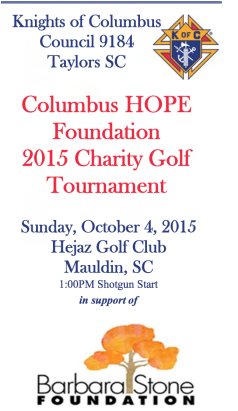 The Knights of Columbus will be hosting our 29th Annual Foundation HOPE Golf Tournament on Sunday afternoon, Oct. 4 at Hejaz Golf Club for the benefit of Barbara Stone Foundation to support Greenville County citizens with disabilities. The golf tournament registration fee has been lowered to $85 for golfers pre-paid by Sept. 27 and $90 after Sept. 27. The registration fee includes carts, greens fee, range balls, lunch, beverages (sodas and beer), all you can eat BBQ dinner from Charlie’s, and door prizes. The tournament is open to players of all skill levels. Please call Howard Sparrow at 864-414-7124 or email kofc9184.sparrow@gmail.com to get more information and register. Please consider helping with this very worthy cause by donating directly to the Knights of Columbus Foundation HOPE fund or providing goods or services as prizes for the tournament. Proceeds from the tournament are donated to the Barbara Stone Foundation. For the past 26 years, the tournament has actively supported their mission of Compassion, Encouragement, Enhancement, and Empowerment for individuals with life long disabilities. Through the years more than $350,000 has been contributed along with countless hours of volunteer work to help individuals in Greenville with disabilities.